On 11 February 2016, the LIGO and Virgo collaborations announced two great discoveries collaborations: the first detection of gravitational waves and the first detection of a binary black hole merger. This catastrophic event, producing the gravitational-wave signal called GW150914, took place in a distant galaxy more than one billion light years from the Earth. It was observed on September 14, 2015 by the two detectors of the Laser Interferometer Gravitational-wave Observatory (LIGO). The peak gravitational-wave power radiated during the final moments of the black hole merger was more than ten times greater than the combined light power from all the stars and galaxies in the observable Universe. This remarkable discovery marks the beginning of an exciting entirely new era of astronomy as we open the gravitational-wave window on the Universe. On 14 September 2015 at 9h50m45s UTC, the two Advanced LIGO interferometers have detected a gravitational wave. It is the first direct observation of such a wave predicted one century ago by Albert Einstein as a consequence of the general relativity theory. The two detectors, separated by 3000 km, have detected the same signal with a delay of 7 ms related to the time needed for the gravitational wave to propagate from one detector (Livingston) to the other detector (Hanford). The measured signals are shown in the figure below. The shape of the measured signal is a “chirp”,as expected from the coalescence of two black holes. The gravitational wave signal lasted for only 200 ms. About ten cycles of the waves have been detected, with frequency increasing from 30 Hz to about 200 Hz. The maximum gravitational wave amplitude reached 10-21: it means that the distance between the LIGO mirrors, separated by 4 km, at the maximum of the gravitational wave varied, by only 2 billionth of billionth of a meter! Window of 200 ms of the signals measured on 14 September 2015 at 9h50m45s UTC in the two LIGO detectors at Hanford (red, top left) and at Livingston (blue, top right). Below, the model of a binary black hole merger that fits the measured signals are shown. 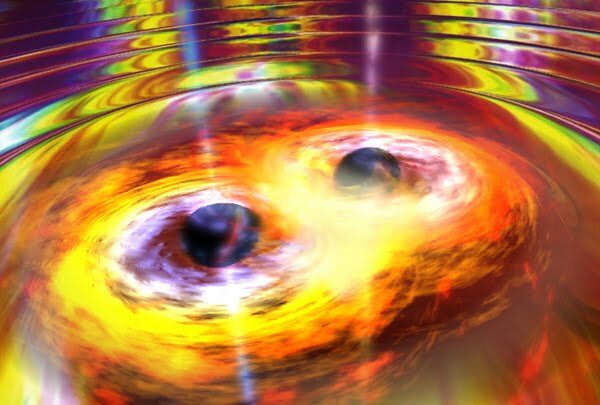 The shape of this first gravitational wave signal allows to understand the source of the wave: two black holes being 29 and 36 times as massive as the sun spiraling together have finally merged into a single black hole of 62 solar masses. Just before they collide, the two black holes were moving close to 200000 km/s, more than half of the speed of light! In 0.2 s, the energy equivalent to three times the mass of the Sun has been radiated into gravitational waves. This fantastic event perturbed the space-time. After a long propagation of more than one billionth years, this perturbation, a gravitational wave, has finally been detected on Earth as an extremely tiny variation of a distance in our detectors. It is the first time that humans are able to see a signal coming directly from a black hole. And this detection proves that black hole binaries system exist and can merge within the age of the Universe. Artist\’s impression of a binary black hole system emitting gravitational waves. The black holes are inspiralling around each other before they merge. For more information on how these results were found and details about the discoveries, see the main publication at Physical Review Letters or the paper summary.